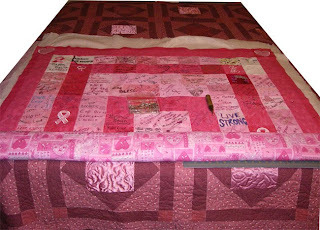 The Breast Cancer Warrior quilts have all been staged into quilt sandwiches. I'm so glad I was able to complete all of the quilt sandwiches over the weekend! That's a lot of pins! If it weren't for my little Kwik Klip gadget and curved safety pins, I'd have myself some sore little fingers. I had to go the route of pinning the quilts since there are so many baubles on the quilts that I am not going to be able to do any design quilting on them. In addition, I would not want any thread design to detract from the written text in each block. So, over the next couple of weeks it will be stitching in the ditch. This should go pretty quick though. During a trip to Joann's this weekend for more curved pins, I came across the new edition of Fashion Fusion magazine in their pattern section. It has 30+ Simplicity designs to view but the best part is that there are 6 coupons on the back of the magazine. Two 50% off coupons and Four 40% coupons good until December 26th 2009. I'm so glad I caught them early this time. I buy a couple of these magazine and then use the coupons whenever I want. I Place a couple in my purse and I'm set for anything I need to pick up at Joanns or Michaels. I've saved a lot of money with these coupons! 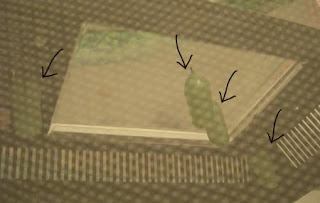 So, we had the caterpillars in the little plastic container and then they started going into Chrysalises. We had to wait until all four larger caterpillars became chrysalises before we could transfer them to the netting container. Do you know how hard it is to come up with a way to hang a solid lid. Thanks to some craft supplies, I was able to come up with a way. Nothing a few curved safety pins and ribbons can't achieve. So, we are patiently awaiting our first round of monarch butterflies! It's not the best photo but since they are already in the netting, it's hard to take a great photo inside it. I just want to thank you for posting the butterflies. Very very informative. When you first posted about them, I kept looking anxiously for the results. You must be so pleased!